A Scottish country house hotel has followed a celebrated French chef by asking to be stripped of its Michelin star rating. Boath House, which has held a Michelin star for the past 10 years, said the dining guide's expectations were "at odds with achievable profit margins". The hotel at Auldearn, near Nairn, said customers wanted a "more informal and relaxed" experience. Last week, Sebastien Bras asked for his eatery to be dropped from the guide. His restaurant in Le Suquet, France, has held three stars since 1999, but Mr Bras said he wanted to be dropped from Michelin's 2018 roster in order "to start a new chapter". In a statement, Boath House owners Don and Wendy Matheson said they too wanted to "re-evaluate their relationship" with the Michelin Guide, after deciding to "move Boath House in a new direction". Mrs Matheson said: "Whilst we are extremely proud of the Michelin star we gained 10 years ago and it undoubtedly enhanced our reputation, our restaurant has consistently made a loss. "We believe that the expectations from Michelin are at odds with achievable profit margins and put an enormous stress on a small family-run business like ours. "The feedback we are hearing time and time again from our customers is that they want an experience that is more informal and relaxed and this extends to the restaurant, the food and even how it is served." 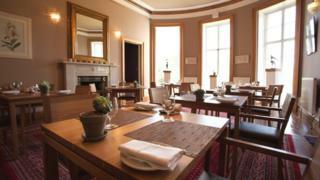 According to the current Michelin Guide, Boath House is "an elegant oval dining room in an early 19C mansion. Well-balanced modern menus showcase the chef's skill and understanding. "Cooking is accomplished, with vivid presentation and interesting flavours - and much of the produce is from their garden or orchard. Sit at bespoke oak tables and take in the lake view." Responding to Boath House's move, the editor of the Michelin Guide Great Britain and Ireland, Rebecca Burr, said: "It's obviously up to individual restaurants how they want to run their businesses, and there is absolutely no formula for winning or retaining a Michelin star. "There has certainly been a trend towards more informal dining over the past 10 years or so, and in fact Michelin has been at the absolute forefront of recognising and celebrating that." Boath House's decision to walk away from its star rating comes as it continues a major overhaul of its operations. The hotel is to open a "casual and rustic" cafe in its walled garden next year, having already made changes to its dining room to allow for "more approachable and less expensive options". A major refurbishment of the hotel's rooms is also taking place. Mrs Matheson added: "The aim is to provide a warm, comfortable touch of contemporary luxury combined with homely charm. "Using local artisanal suppliers, the interiors of this design-led restaurant with rooms intends to deliver a Highland experience without undue formality. "We are confident that this is where the accommodation and dining market is going and that we will have a more sustainable product. "It will be interesting to see whether this will be reflected in subsequent reviews of our restaurant with rooms by industry bodies in the hospitality sector."